Don’t throw your Saturn away, look what it can play! Shining Force III Scenario 1: God Warrior of the Kingdom is one of those classic games you often hear spoken of in laudable terms. It’s also one of the less commonly played games so laudably labeled—mostly because it came out in limited numbers at the end of the Saturn era. Still, it’s one of the finer examples of a grid based SRPG. It’s the first of three in a series, but only this installment was released for America. However the game does not leave you hanging and has a fine ending in its own right. Of course there are a number of unresolved series story arc plots that remain. 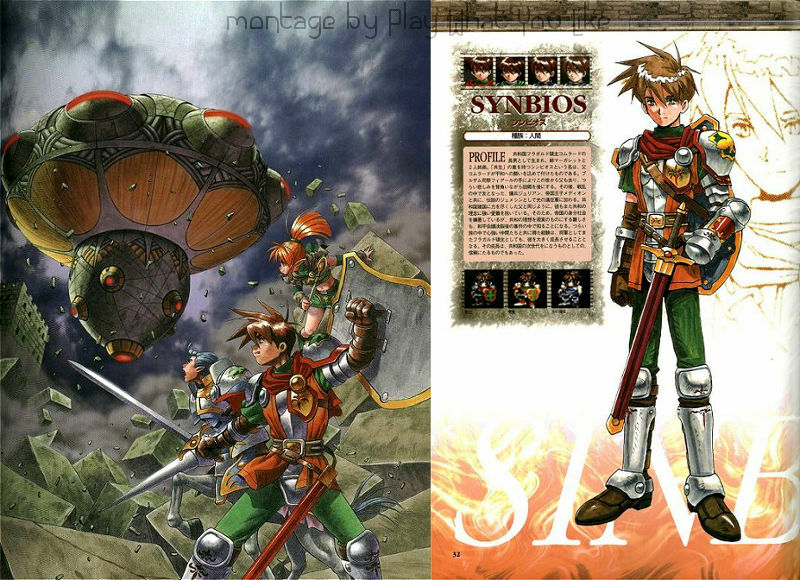 The game was a trend setter and trailblazer regarding many SRPG qualities. It also put elements together in novel and good ways that, to this day, have not been taken up significantly by the genre. It’s a huge game that broke new ground and maintains high quality. There will be a lot of “goods” below, both as SFIII is compared to other SRPGs, and because of the era in which it was released. There’s ample story that’s reasonable and not vapid. This game by design weaves a large tapestry of factions and characters for itself and two sequels. However it’s not overly burdened by it. Most elements are introduced at an acceptable and digestible pace. The game grabs you with its first line of in-game dialogue. It’s one character yelling at another in huge font asking if he is paying attention. This fun and funny technique is not overused. 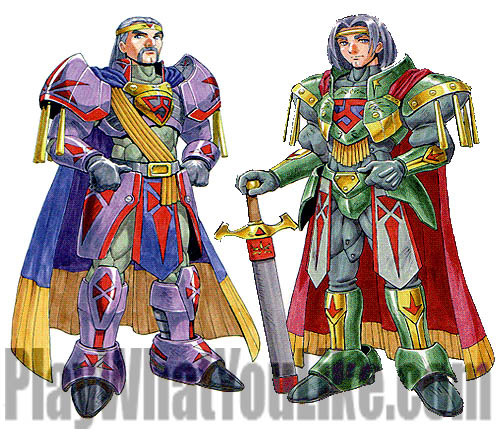 The Shining Force franchise has a long history with centaur knights. The Stat Numbers are Low. HP and the like are in the teens and twenties for much of the game. It makes stat management easier to grasp and wrangle. The drama is very well told through crafted in game cut scenes. Often when the little map characters are told something shocking they do a quick stretching “take”. It is one of many elements including scripted camera movement that makes these scenes work well. The stage is alive as characters move around town and perform activities. Scripted camera set-up shots might show something special about a character or introduce a town. Real 3D free-roaming towns are a good thing. Combat strikes are portrayed in 3D model mini-cut scenes. Okay, so the graphics are collections of polygons right out of the 1990s. However, these short scenes—often time-wasters quickly turned off, are a surprisingly interesting addition. 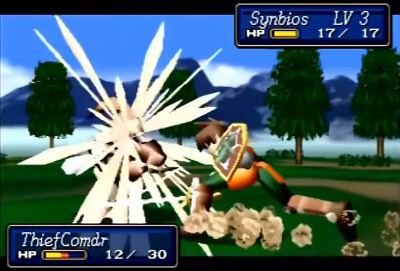 They also differentiate critical hits with fun animations. The VFX: We moved them from “Good & Bad” to “Good” mostly because of those used for the 3D critical attacks. The archer’s swirling ice shot of doom is particularly pleasing. The GIF animation doesn’t do it justice. 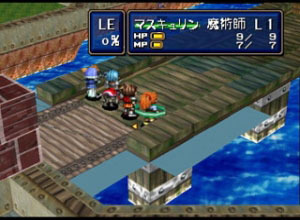 Within a larger battlefield and during the combat, the player can choose to have some characters enter a sub-dungeon (called ruins). This separate area is within a nearby structure and is optional, but contains treasure. Thieves also enter to thwart your treasure hunting, making some sub-dungeons especially challenging. This is a well thought out and novel addition to the SRPG format. It forces so many additional tactical decisions. 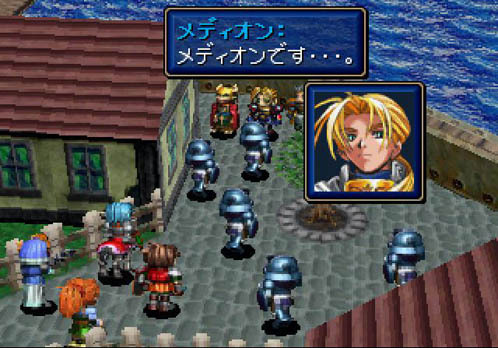 “How many of your squad can you spare from the main battle to go into the dungeon?” “Who is the closet to the entrance?” This feature, adding an additional tactical dimension to a battlefield, has not been similarly implemented in SRPGs to this day. A fine example takes place in one of Shining Force III’s most fun and challenging battles. The train yard. Train tracks run through the battle area. Every turn the trains move a little farther along the tracks changing the lines-of-site and traversable paths. Turning the environment from static to dynamic multiplies the tactical decisions. Throw in some dramatic time sensitive elements like saving civilians, and you have a great recipe for an intense SRPG level. Why is this dramatic element so absent in the many entries into this genre since Shining Force III? It’s one of this games most conspicuously different and notable achievements. 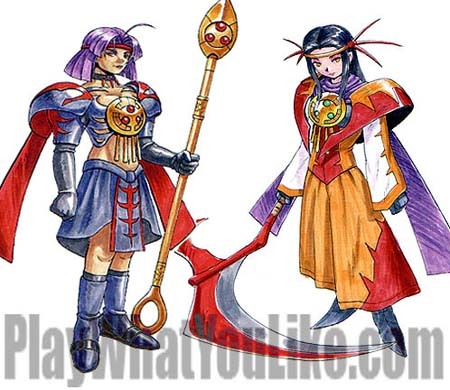 It points out one of the most glaring missing elements in later SRPG’s. 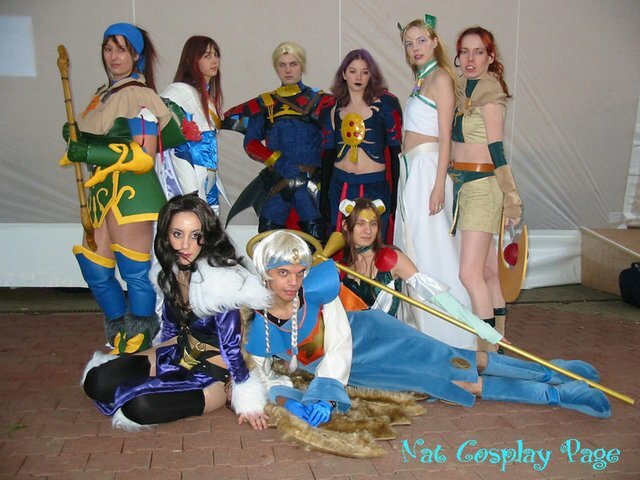 This is more Shining Force III cosplay than you may be able to take! This isn’t the first or last you’ll see of “partner systems.” That is boosting a character’s stats by having them near another character in which a relationship has been built. However this never makes enough difference to enter into our strategy. Also criteria for forming relationships seems nebulous. 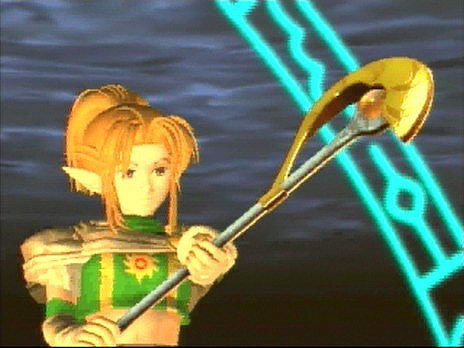 Remember the days before recent Final Fantasy titles when male RPG characters were masculine? The art style was …okay. It may or may not be to your liking. Additionally the portraits are somewhat inconsistent. Some are good and others unremarkable. But none are bad. Some boosting accessories come with a surprise cost after you put it on. Your character is “cursed” and given some sort of drawback. Some players may find this kind of thing fun, but we felt blindsided. Not as bad as being blindsided by a queen worm. Eww! Fighting on “world map” terrain. Some battles take place right on the world map. They’re a great way to make the setting more real, adding immersion. But it comes at the cost of slightly boring and flatter battle terrain. This NON-worldmap terrain, elevated blocks of land and narrow walkways, is a great example of battle-terrain design—and it looks good too. Bridges are a great bet for tactical fun. The story is a wide ranging three game arc. As mentioned under “Good,” it’s ample and fittingly serious with the grandeur of a complex interesting world. However the story elements and bad guy motivations can be a little confusing. Their foundation is laid seemingly elsewhere. It’s one faction too many. Good items are rare. We like such items to be doled out carefully, but not miserly. Failing to obtain one in difficult battlefield sub-dungeons can be frustrating. …and it also fires LaZerS? 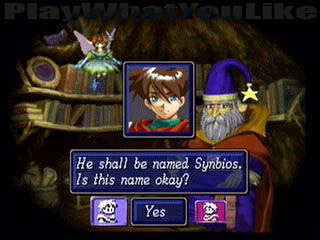 The given name of your main hero is “Synbios.” This can be changed, but come on, cannot we do better than that SEGA? “Synbios” sounds like part of the Windows boot-up sequence. Uh, no. It’s not okay. Shining Force III is truly a great SRPG. It has polish, exemplified even in the shell screens. A wizard and fairy greet you upon starting a play session. When you’re finished, often late at night for us, the fairy bids you goodbye as the wizard has just fallen asleep. It’s a cute denouement, and one we recall fondly. Rachet, on the right, yells “Gestalt!” during his special attack. 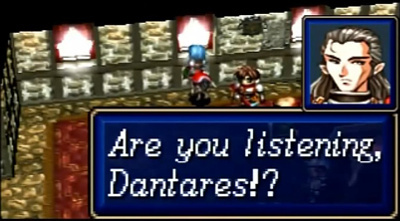 Now THAT’S dialogue you don’t record for a SRPG often. 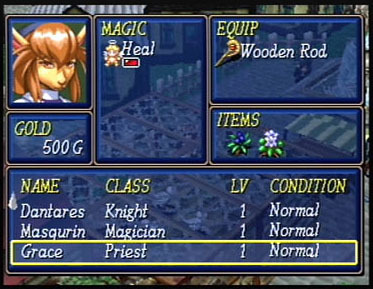 Our Shining Force III experience used a slightly finicky Saturn/disc combination, but it was worth all the trouble and technological wrestling matches. The game makes every battle seem epic. This is partially due to a welcome absence of grinding, and to careful ramping, planning and story. Shining Force III is a great example of “quality never goes out of style”. How about those 90’s cut scenes? Do they go out of style? Updated: 01/25/2015: Many new pictures, prep for SCIII Scenario 2, and a polishing of the points.